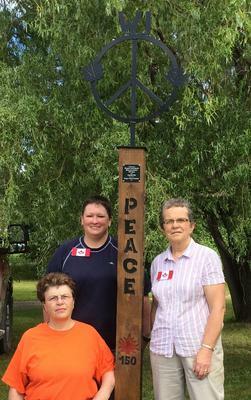 Glasgow WI erected a Peace Pole today in Waba Gardens, White Lake. This pole was craved out by one of our own members. The pole is a 6x6 cedar post. On each side we wrote the word peace in a different language. 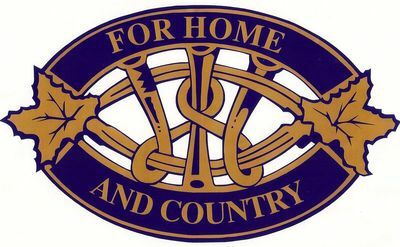 The languages we chose are English, Algonquian, French and Gaelic. The Peace Pole symbolizes the oneness of humanity and our common wish for a world at peace. It reminds us to think, speak and act in the spirit of peace and harmony. Plaque at top reads: "Celebrating Women's Institutes for Home & Country 120 Years and Canada 150, Presented by Glasgow Women's Institute 2017"
On each side of the post is the word "Peace" in different languages.